giugno 2018 – Close up on me ! Head Skin Applier : THE SKINNERY ( bronze tone) Default on Genus Folder!! Shape : PERFECTLY PRETTY – Kylie Bento Shape For Genus Project. By MeCOMING SOON!! Ring : COLIVATI JEWELRY – Maria 60K Engagement Ring – White . Shorts : BLUEBERRY – Fye Shorts – Fatpack . By Blueberryx NEW!!! Shape : PERFECTLY PRETTY – Kylie Bento Shape For Genus Project. By Me COMING SOON!! Top : BLUEBERRY – Leah Top – Fatpack . By Blueberryx NEW!!! ON AMBRA : Refer to her blog! Coming soon! Shape : MY PERSONAL SHAPE. Top : BLUEBERRY – Fye Ruched Top – Fatpack . By Blueberryx NEW!!! 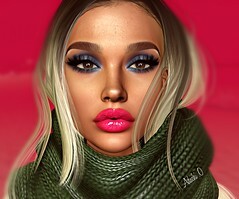 Website about our products in Second life. Clothing, Shapes, Skins and skin appliers - Catwa&Maitreya&Omega&Genus and other avatar enhancements. "Pretty is past, weirdness is the new black.... "
All about shoes heels fashion !